The mace was presented by former India captain and ICC Cricket Hall of Famer Sunil Gavaskar at a ceremony following the team’s sublime 321 run win against New Zealand in Indore that also ensured a 3-0 whitewash – first for Virat Kohli-led side. India were already assured of finishing at the top of the MRF Tyres rankings after winning the second Test at Eden Gardens thus regaining the position from Pakistan who had climbed up post a 2-2 draw with England. Since the rankings are only updated at the end of the series, India formally replaced Pakistan at the top of the table at the end of the Indore Test. 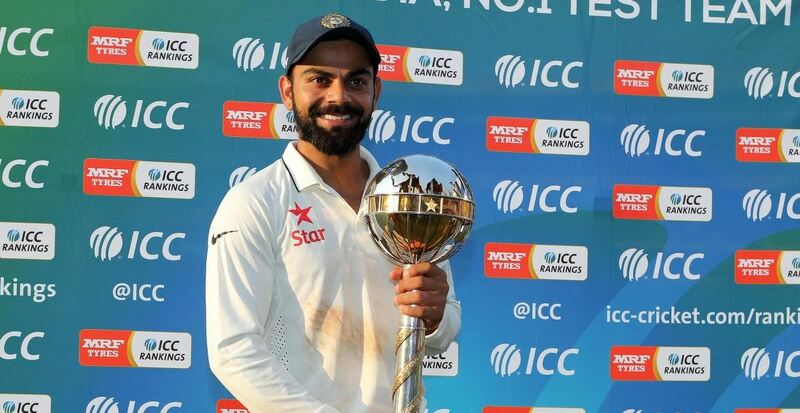 “It’s an honour and a moment of great pride to receive the ICC Test Championship mace. To be recognised as the best in the traditional form of the game is as good as it gets for any team and stuff that dreams are made of,” Kohli said. Kohli became only the second India captain after Mahendra Singh Dhoni and 10th overall to receive the mace, even though it is for the third time since Kohli took over as captain that India have led the rankings table. longest stint at the number-one position was from November 2009 to August 2011 under Dhoni. The other captains to have received the mace are Steve Waugh, Ricky Ponting, Michael Clarke, Steve Smith (all Australia), Andrew Strauss (England), Graeme Smith, Hashim Amla (both South Africa) and Misbah-ul-Haq (Pakistan). Kohli credited his players for performing consistently to take the team to the top. “Individual performances are important, but in the end it is what those performances do for the team that matter. If we have been able to become the best in the world, it is because there is a lot of bonding among team members and there is always someone to raise his hand in a difficult situation. I think that is what makes a top side. “I would like to thank all players and support staff, who have all been part of our team because I feel such an achievement is only possible with contribution from all quarters. To reach the top of the Test rankings takes a lot of hard work and perseverance,” the India captain said. Kohli said playing Test cricket is an ambition for any cricketer and to be part of such a team is to be treasured. “We all grow up playing cricket, hoping to represent our country in Test cricket. But to be part of a team that does well continuously in Tests is something altogether different. I am confident we will continue to win matches at home as well as abroad in the coming seasons. I want this team to be remembered as one of the finest Test teams ever,” Kohli said. Gavaskar said such an accomplishment will be cherished for years to come. “I have always believed that Test cricket tests you in every way. To come out on top over a period of time and be acknowledged as the best in this format is a big achievement. It is a result of sustained efforts in different conditions. “I have some fine memories of Test cricket from my playing days. Taking on a top team in Test cricket was what pumped us up and certainly something that I always looked forward to,” said Gavaskar. ICC Chief Executive David Richardson praised India for regaining the top spot within weeks of losing it to Pakistan. “I congratulate India for some fine performances which have helped it win the ICC Test Championship mace during a great period for Test cricket. The number-one ranking has changed hands three times in as many months, indicative of the current competitiveness of Test cricket at the highest level, which is great for players and fans. “With other sides in touching distance of the top, the MRF ICC Test rankings continue to provide great context for the traditional format of the game. I wish India the very best in their efforts to stay at number one,” Richardson said. Only seven points separate the top four teams with second-ranked Pakistan (111), third-placed Australia (108) and fourth-placed England (108) all featuring in upcoming Test series. Pakistan, which is playing the West Indies in a three-Test series in the UAE this month, is also due to tour New Zealand and Australia over the next few months. Other upcoming series include England and Australia’s tour of India and tours by South Africa and New Zealand to Australia. The busy calendar means that the race to the top spot for the annual cut-off date of April 1 can be expected to be intense. The side that tops the ICC Test Team Rankings on that date will receive a cash award of $1 million. The side placed second will get $500,000 while those finishing third and fourth will receive $200,000 and $100,000, respectively.